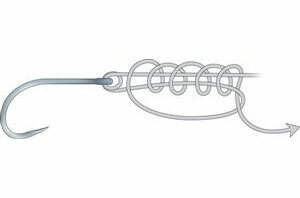 Although detailed here using a spade end hook, the Domhoff fishing knot can be used around the shank of an eyed hook, and when tied securely this is an incredibly reliable knot to use. 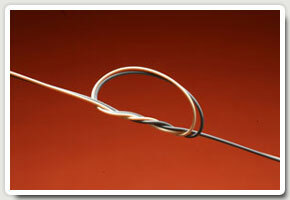 It is made up of a series of eight whips around the hook shank. 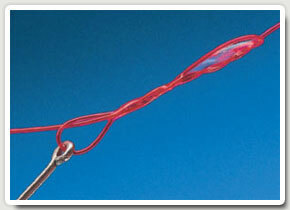 This creates a neat lock upon the hook that won't slip and will not lose any strength as the line is pulled tight. Most anglers do use this knot for tying their spade end hooks (if they don't own a hook tyer) but if you're suffering lost hooks or broken knots when fishing with eyed hooks you really ought to give this knot a try as it's super-secure. It can be used to tie the tiniest of hooks through to whopping size 2 speciimen eyed hooks - all you have to to is match the strength of line to the hook size and guage and you're on to a winner. Make a loop in the end of your line. 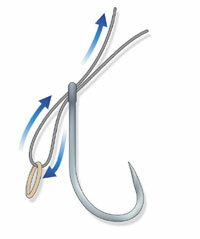 Lie the loop against the shank with about 1cm beyond the bend of the hook. Hold it tight in place between finger and thumb. Now take the free end of the line and start to wind it up the hook shank, holding the loop between thumb and forefinger and securing the other part of the line underneath the coils. Keep everything under tension. After eight turns or so trap the whippings with your other hand to reveal the loop. Now pass the loose end through the loop. Dab with a touch of saliva and tighten by pulling on the main part of the line. Make sure the line leaves the hook from the front of the spade or the eye and the coils are neat. This is the finished knot. Tie off the tag end neatly. STEP 2: Fold the loop over to form another loop. STEP 3: Pass the first loop at least twice through the second loop. STEP 4: Moisten the knot with saliva and pull it tight. Trim the knot and you are away. 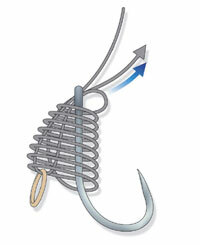 If you wish to hook and land seriously big fish, the Palomar knot is one knot that you ought to learn how to tie. It provides excellent grip upon both swivels and hooks, it retains masses of strength and it’s a very reliable knot to use too. It is a very simple knot to learn – anyone can tie this knot – and once mastered you will be sure that your link between line and fish is a strong one. 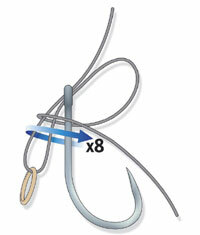 The reason why it is so strong is because two lengths of line pass through the hook or swivel so the load is spread out equally upon the line, as opposed to having just the one length of line wrapped through the eye of the hook or swivel. What’s more, the more you pull this knot, the more secure it becomes. 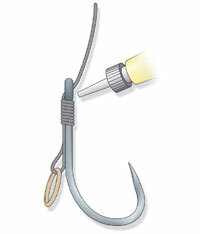 Fold your line over and thread it through the eye of the swivel or hook. Now loop the doubled-up line over and pass the tag end through the loop you have just formed. 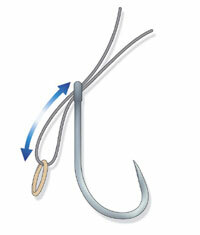 Pass the end of the doubled-up line over the swivel of the hook. Work the knot closed with your fingers and dampen it with saliva. Now gently pull the swivel or hook and the line away from each other to tighten. The finished knot should be compact and neat. Trim off the tag end and away you go!